The Halloween moon reflected off of the wet pavement, the midnight hour approached, Abandon of Melvindale was poised to be the last hurrah of the 2015 haunt season. We parked and walked around to the opposite side of the building where things were quiet, too quiet. Despite the lack of a crowd, an energy was in the air. John and I met the owner of Abandon, a man named Jason. He engaged us in earnest and shared ghost stories, EVPs and anecdotal evidence of the paranormal events that had occurred both inside the haunted house itself and Play Atlantis, the family fun center in which Abandon is located. One hair raising example involved an actress who fled the haunt in tears and refused to return after someone whispered an ominous warning into her ear. In another instance, a little girl was found crying outside of a bounce house by her father and a manager of Play Atlantis. When questioned, the little girl reported that she had been shoved by a second girl inside the bounce house although at the time, that family were the only customers present; neither the father nor the manager ever saw the child in question. The stories served as a great backdrop to the haunted attraction — with goosebumps crawling across our flesh, we were swallowed by the oppressive darkness of Abandon. The music of Midnight Syndicate, a selection that was comprised of Gregorian chants and orchestral music, boomed throughout the voluminous space. The sound echoed so loudly that it was difficult to hear anything else which caused me to feel exposed and vulnerable. We could discern an incessant knocking, a portent of doom that created a strong psychology reaction. Although we would never discover the source, that sound would follow us throughout Abandon. We trudged up and down long, wide ramps in near total darkness and on more than one occasion I thought I spotted a shadow figure amidst the gloom. Whether spirit or trick of the mind, the shapes evaporated any time I drew close enough to investigate. My heart raced like it had not raced in a good many years while inside a haunted attraction. I turned to John and inquired about his own state, his heart too threatened to beat straight out of his chest. This was old school at its minimalist best and Abandon made no apologies for it. The majority of the actors hit us with quick, effective startles; appearing and disappearing so fast perhaps they were phantoms themselves. A select few spoke and while their delivery was passionate, the content of their speech was too generic for an otherwise amazingly effective haunted attraction. John would later comment that Abandon was so absent of light that it was difficult to discern details about a given scene, but this was no criticism. That fact further reinforced the sensory deprivation concept and made sure that we were on edge the entire time. There is, of course, room for improvement — an unnerving narrative is just waiting to be spun by a few clever characters; in addition, Abandon is aching for a finale to capitalize on all of that tension. Regardless, it’s great to finally have a bare bones, old school haunt in the Downriver area once again. Ever since Extreme Scream left Taylor following the 2009 haunt season there’s been a hole in my heart and now Abandon has emerged from the blackness to fill the void. While the cover art of the 2016 edition of the Fear Finder dazzled, the content inside the treasured seasonal publication left me yearning for more. Very few new haunts were featured, in fact, if you exclude the returning Scream Machine, there was just one new entry — Haunting in the Hills. Haunting in the Hills will include an outdoor trail of sorts, a haunted hayride and Train Car of Terror. This event will be held in Onsted, Michigan at the Stagecoach Stop Western Resort. So, who’s not in the Fear Finder this fall? Quite a number of places, actually. Below, I’ve highlighted some notable omissions. Abandon, Bonadeo Farms, Exit 13, Hallowe’en in Greenfield Village, Haunted Elementary, St. Charles’ Village of the Living Dead and A Terror in Townsend Forest are not listed in the Fear Finder for 2016 but each of these attractions will be open and are advertised elsewhere. Also missing in action are Erwin Orchards as well as Krazy Hilda’s; no word yet whether these haunts will be open or closed this season. The Boneyard in Stockbridge announced several months ago that it would not be operational in 2016 so that particular vanishing act came as no surprise. Also dark for 2016 is Heck of a Haunted Barn in Monroe. The big shock however was the announcement just days ago that Dark Legacy in Wixom would be closed. Dark Legacy is a powerhouse and had advertised everywhere since exploding on the scene in 2014, no specifics are known as to why it will be closed this season. The biggest disappointment was word that The Dark Box will not be open after an intriguing rookie season. According to the folks there, the City of Pinckney took issue with the physicality employed at The Dark Box. 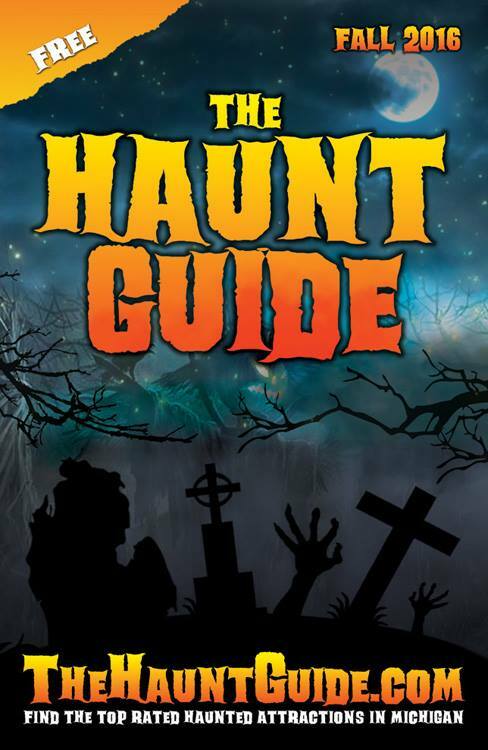 The 2016 version of The Haunt Guide is now available to view and download at the Michigan Haunters Association website. Long time readers may notice that the cover art has changed, gone is the self-reflexive skeleton who was pictured reading a copy of The Haunt Guide. As you can see above, the cover page now features a cemetery scene set beneath an inky night sky — there’s even a tombstone shaped like the Wolverine State. Most of the haunted attractions advertised inside The Haunt Guide have become mainstays with that publication in recent years but there are a handful of interesting entries to note. The most prominent news is the addition of a third attraction, called Dead Souls Corral, at The Realm of Darkness in Pontiac. No word on whether the new attraction is an indoor or outdoor event or exactly how it might, if at all, interact with the other attractions there. It’s good to see that a pair of first year hits will return for a second season — Abandon at Play Atlantis in Melvindale and Rotten Manor in Holly. The team at Rotten Manor does not appear content to rest on the laurels of 2015 having added Rotten Forest and a third attraction ominously dubbed, Clown Barn. I was very excited to see a new haunt by the name of Awaken located in the small town of Leslie, Michigan which is a mere 15 minutes south of Mason, home to Shawhaven Haunted Farm. Also new to The Haunt Guide is Wicked Woods of Terror in Caro, Michigan which isn’t terribly far from Haunted Elementary in Bridgeport. Haunted Elementary is now under the umbrella known as Bridgeport Goregrounds which also boasts a 3D attraction called FrightSite and a third known as Outbreak. Lastly, after two years in the dark, The Scream Machine will whir to life once more — this time at a new location in Taylor on Ecorse Road. I sincerely hope the one-time Downriver staple can reinvent itself and rise from the ashes of a dismal 2013 but I do have reservations. The ad featured inside The Haunt Guide is strikingly similar if not identical to the one that was used during the last few years of The Scream Machine’s initial run. It doesn’t help matters that, as of the time of this writing, the ad also includes a web address that doesn’t work. Howl at the moon, baby. I went to bed last night with thoughts of Rotten Manor and Abandon swirling in my head and when I woke this morning those same thoughts remained stuck in my mind. What had we experienced? Had our eyes deceived us? Did any of that really happen?! When you find yourself pondering such questions that’s when you know you’ve witnessed an all-time classic and on Halloween no less. After some trick r’ treating with the little ones, which included one seriously awesome yard display on Kings Highway in Lincoln Park, John and I hightailed it into the night. This has been a haunt season busier and longer than any that has come before it — we were admittedly feeling road-weary as we drove north on I-75 through increasingly poor conditions. The further north we traveled the harder the rain hit the pavement and the lower visibility sunk. But any fear that Halloween would become a washout began to recede the moment we arrived at Rotten Manor. The facade was far more impressive than it had appeared in pictures; it jutted from the landscape like a mountain in a valley and what lie on the inside was more impressive still. Rotten Manor was a half-hour trek through expertly detailed and creative environments that held inventive scares, glorious eye candy, surreal strangeness and the omnipresence of a Charlie McCarthy ventriloquist dummy. 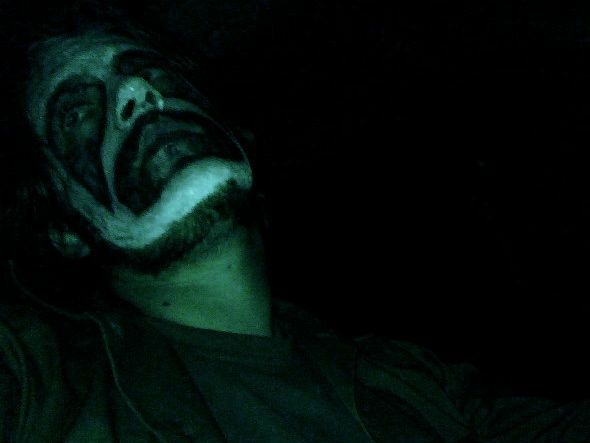 Loaded with live actors, psychological warfare and several unique features — Rotten Manor blasted itself into the rarefied territory of our all-time best haunted house adventures. As we drove in the direction of home we reveled in the experience and thought it a shame that Rotten Manor hadn’t been our last stop of the night because it seemed impossible that anything could follow that. Indeed, another first year attraction, Abandon had its work cut out. We pulled into Play Atlantis in Melvindale a little more than an hour after we had departed Rotten Manor with that experience fresh in mind. Somehow, Abandon would make an impression all it’s own. Abandon took old school to the nth degree and in the process redefined minimalism. The cavernous, multi-level haunt supplied atmosphere in spades; an effect that was heightened by the expert use of Midnight Syndicate’s booming medieval music. So much of Abandon was purposely understated which provided the imagination free range to manifest horrors hidden in every shadow. Fueled by ghost stories and a genuine sweep from a team of paranormal research investigators (go on, I dare you to ask about the EVPs), Abandon possessed an eerie vibe that is difficult to find. In terms of pure fear factor it was one of the most foreboding and frightening haunted attractions we’ve toured in all these many seasons. A heartfelt thank you to Wally, Eric and the rest of the large cast and crew of Rotten Manor and to Jason of Abandon who patiently shared creepy stories including his own personal encounters. 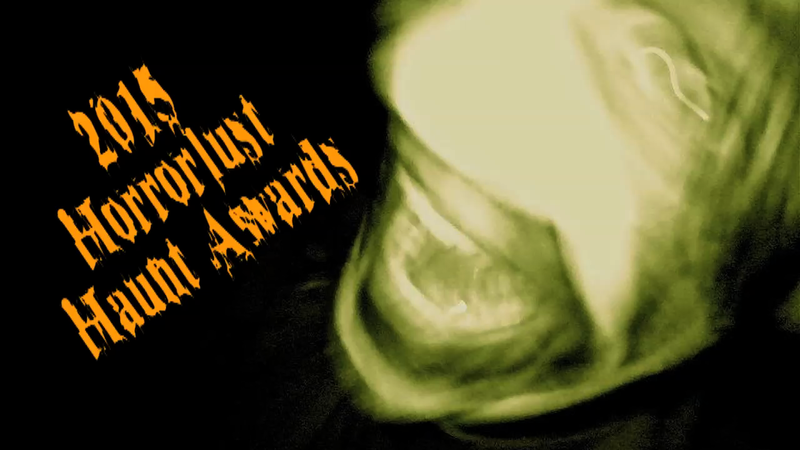 All of you made Halloween 2015 a truly unforgettable night of haunting that will live on in Horrorlust lore for many moons to come.